I have a feeling that this guy might be on to something! Another find from my hard drive and I have no idea where this picture came from. If you know, then let me know in the comments! 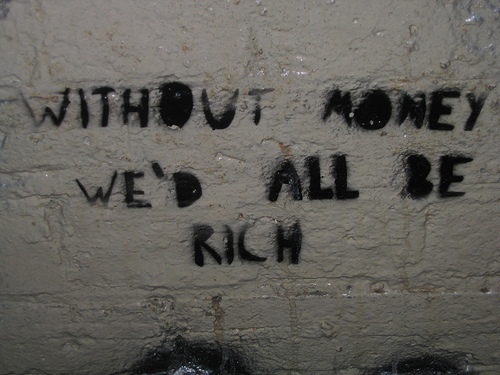 Well… without money how would we be able to get the things we want in life? Incentive is lost, etc. So I don’t know how it makes sense. If you think about it then there were people long before there was money. And even without money there were people who were rich – these people simply had the most power and most useful things that made them valuable in the eyes of other people. Chicken Noodle Soup, I’d like to know a little more about your website – it seems to be one of those niche oriented websites that everyone is talking about lately as they should be good for making money with ads. How is http://www.chicken-noodle-soup.net doing in terms of ad click-through rates and etc? I think if we didn’t have money we wouldn’t be greedy and then we would do things for each other instead of doing things for money. We would all be alot richer in that sense. What Australia isn’t on the list? Lots of angry, brainwashed nationalists around here though.